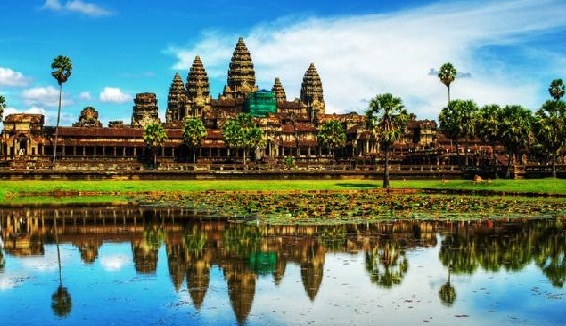 Siem Reap is the gateway to Angkor Wat, one of the most impressive ancient temple complexes in the world. Siem Reap is easily reachable by air or bus from Bangkok or Vietnam. Citizens of most countries can apply for an electronic visa (e-visa) online for $25 USD or can pay for a visa on arrival for $20 USD. Purchasing a visa (especially at land crossings) requires dodging many scams including paying significantly more for visas at travel agents, fake customs offices and even "tips" and surcharges requested by Cambodian customs officials. A passport photo and an empty, blank page in your passport is required for the visa. Though Cambodia has it's own currency, the Riel (KHR), US dollars are the primary currency. Riels are only used for transactions less than $1. Exchange rate is 4,000 KHR = 1 USD (May 2013). ATM's dispense US currency. Try to find Canadia Bank ATM's since they do not charge an additional fee for foreign cards. Tipping is not common in Asia. Bangkok Airways and Cambodia Angkor Air have frequent flights from Bangkok. Departing Siem Reap airport requires paying a departure tax of $25 which is included in the price of your ticket. Many tour companies sell cheap ground transport tickets though most are scams. A new direct bus operated by Transport Co (government bus company) now makes a daily trip from Bangkok's Mochit Bus Terminal at 9am. Travel time is approximately 8 hrs including stops and border delays. There are reports that they stop at a travel agency to sell overpriced visas. The bus terminates at the Nattakarn travel agency office on Sivutha Rd a couple shops north of the KFC. Buses leave here daily back to Bangkok at 8am. Siem Reap's tuk-tuks are four-person trailers attached to scooters. Rides within the city should not cost more than $1. Tuk-tuk drivers can provide tours to Angkor Wat for approx $12-$15 not including entrance fees. 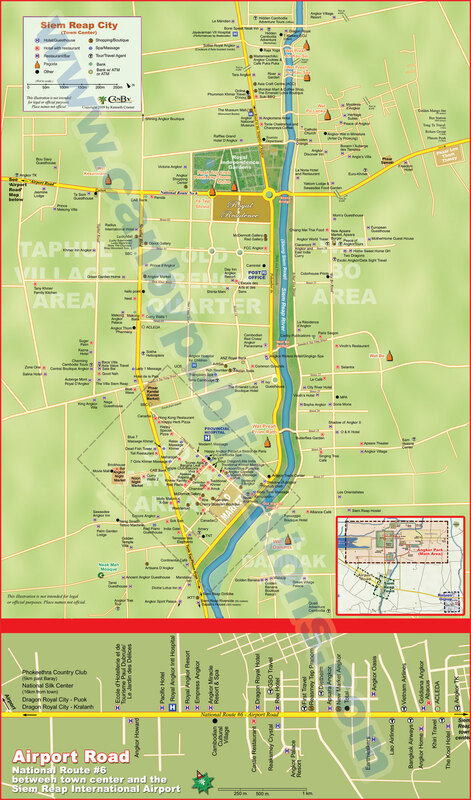 There are many temples in the area and tours can be divided into several circuits. A photo pass is $20 for one day or $40 USD for three days. Since it gets very hot, it is recommended to start early in the morning to avoid the hottest periods and tour groups in the afternoon. Small Circuit - Visits the main temple at Angkor Wat, the buddha lined west gate of Angkor Thom, Banyan Temple with the many Buddha faces, Bauphon Temple, Elephant Terrace, Ta Keo, Ta Prohm (Tombraider temple) and Sras Srang (manmade lake). Big Circuit - This circuit includes Pre Rup, East Mebon, Ta Som, Neak Pean (a lake), and Preah Kahn. You can usually add Banteay Srei, Banteay Samre for an additional $20. Along the way are the landmine museum and butterfly farm. Rolous Group - Older and smaller temples located further east of Siem Reap which is a convenient stop if visiting Bang Melea. Old Market - this covered market sells food and souvenirs. There are restaurants on the north side. The real local market is Phsar Leu located 3km northeast on National Rd 6. There are a few small air conditioned malls including Lucky Mall on Sivatha north of the KFC with a supermarket and fast food restaurant and Angkor Trade Centre north of the old market along the river. Pub Street - a short street with many restaurants and bars. Closed off to traffic in the evenings. There is a post office at the northern end of the city. You can stop here coming back from Angkor Wat. There are reports of tourists being overcharged for stamps. ©2011- Citytravelwiki.com All rights reserved.